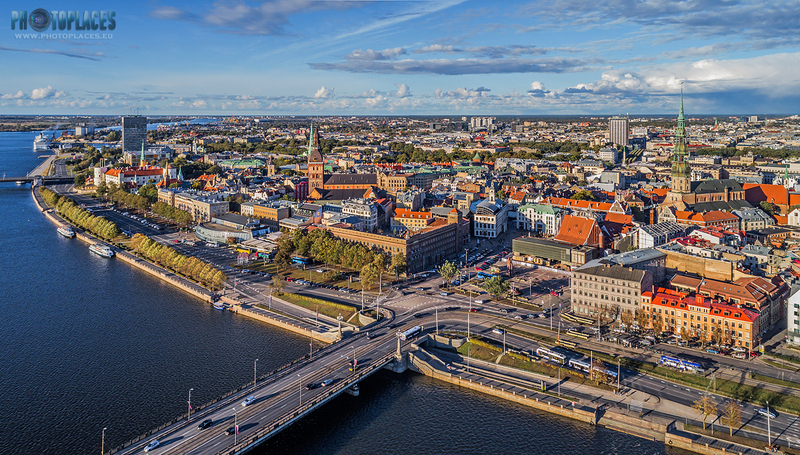 According to local criteria and official statistics, Latvia has 67 towns and 9 cities and high urbanization level (around 70% of population lives in the cities/towns). 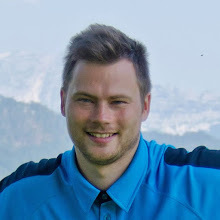 According to more widely used international criteria, for example, Konstantinos Doxiadis classification which defines the city as starting from 100 000 inhabitants, the only "real" city is the capital Rīga (Riga) with the population of 700 000*. Second and third largest towns in Latvia (Daugavpils and Liepāja) has lost city status due to depopulation process in last 30 years - both of them had more than 100 000 inhabitants at the end of 1980ies but now has 98 000 and 80 000 (respectively). Riga is by far the dominant urban hub in Latvia - most political, economical, cultural and other type of activities are going on there. Agglomeration of Riga has more than million people - over half of population of Latvia and GDP of this region makes up 70% of whole Latvian economy. Not surprisingly, also most architectural values are concentrated in Riga. Riga has suffered in both World Wars however it escaped too harsh destruction and most of the city's historical buildings were preserved. 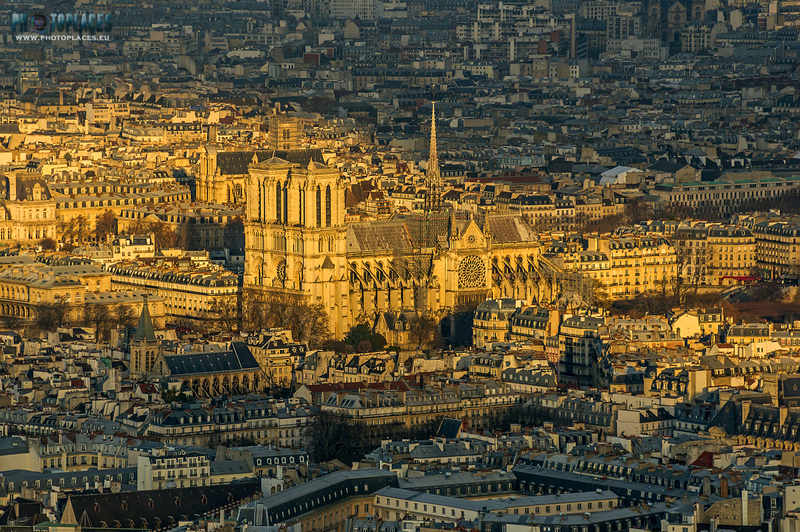 There are hundreds of wonderful apartment buildings from the beginning of 20th century, including many Art Nouveau pearls, examples of older buildings from previous centuries as well as quite a rare phenomenon in a large city - many historical wooden houses. Notable Art Nouveau heritage can be found also in Liepāja town which despite of damage by wars can still be considered the second richest in terms of architecture and cityscape in Latvia. Of other larger towns in Latvia, lots of picturesque photo places can be found in Jūrmala, a seaside resort town next to Riga, which offers beautiful historical villas and also interesting modern apartment buildings. 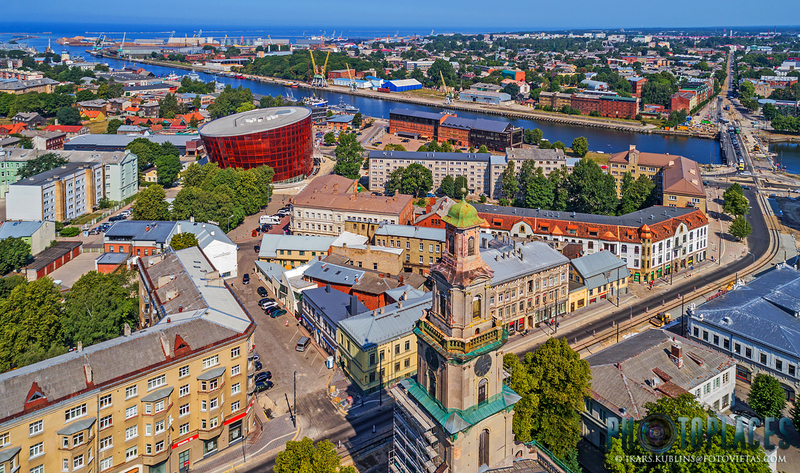 Developed, sleek-looking town with an interesting historical centre is Ventspils, and also the second largest town Daugavpils has quite many great buildings and photogenic sights. Probably the most underrated larger town in Latvia is Jēkabpils which has a very special, gritty charm in it's two historical districts on both sides of Daugava river. There are also several nice smaller towns in Latvia. Kuldīga is out of competition here as the most historically authentic town in Latvia (it's centre basically hasn't changed in last 100+ years, the planning and buildings has been preserved from 13th-19th Century). Another old and beautiful town in Latvia is Cēsis which boasts not only with nice historical streets but also two castles and impressive central church. Talsi besides it's architecture has an additional value in beautiful natural setting around several hills and lakes, as well as Bauska which got luck to be situated at the confluence of three rivers. Sigulda is another unique place - the town itself isn't rich in terms of historical architecture but it's natural surroundings (the Gauja river valley) are breathtaking. Similar (although in a bit smaller scale) beauty can be found in the small towns next to Abava river valley - Sabile and Kandava. Tukums, Limbaži and Krāslava offers interesting architectural experiences. Probably the largest urban tragedy in the history of Latvia has been the destruction of Jelgava town in the end phase of World War II, when the Soviet Red army bombed the town almost completely to the ground (more than 90% of buildings were destroyed). Before the war Jelgava was one of the most beautiful larger towns in Latvia. After the war it was rebuilt in bleak soviet functionalism style however some of the main landmarks - such as Jelgava palace, Academia Petrina museum, several churches and a few other buildings have survived - and they still makes Jelgava a worth-to-visit place. RIGA. Main trump of Latvia's capital city is the unrivaled collection of Art Nouveau buildings from 20th Century beginning, as well as nice Old Town with a beautiful skyline made of medieval church spires. Riga has also got several modern landmarks, enjoyable parks, wide river in it's centre, good old perimetrical planning of it's 100+ years old central apartment districts and a big, cosmopolitan city feeling. LIEPAJA. Located at the western shore of Latvia, third largest town in the country charms with it's great historical architecture (many Art Nouveau buildings too), location at the Baltic sea and easy-to-reach beach, unusual structures of historical, gritty Karosta military district and a strong culture life (often labeled as the music capital of Latvia, Liepaja boasts with a brand new modern concert hall). KULDIGA. 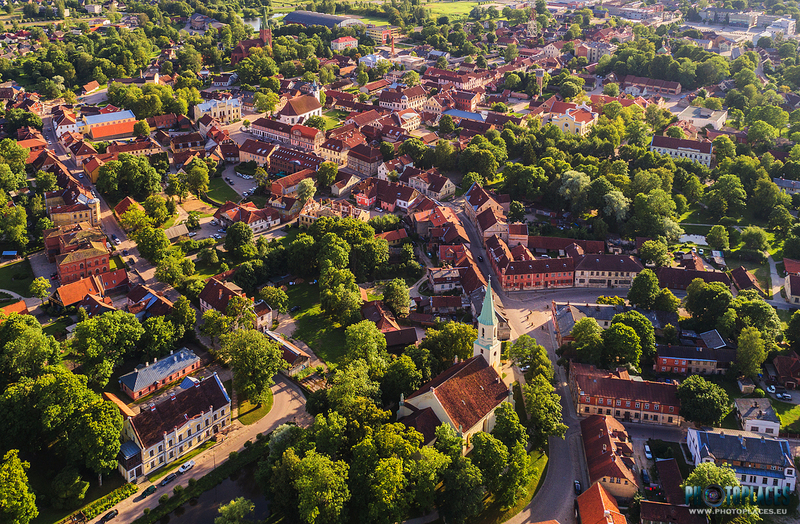 Escaped war damage and conserved in time, Kuldiga offers the most authentic historical townscape experience in Latvia. It's old buildings, covered with red tile roofs, charming streets and a great nature monument - the widest waterfall in Europe (Venta Rapids) has made the place a strong tourist magnet. CESIS. Another good looking and cosy historical town which amazes not only by it's bit hilly and winding streetscapes but also medieval castle ruins and beautiful park surrounding them, old and tall church at the central square, as well as nature sights in the vicinities (Ergli cliffs at the Gauja river being the most impressive one). SIGULDA. Sigulda could be named as the "nature capital of Latvia". As an urban place it's nothing special but the real beauty lies in town's natural surroundings - Gauja river valley here offers plenty of spectacular view points, hiking trails, caves, etc. JURMALA. 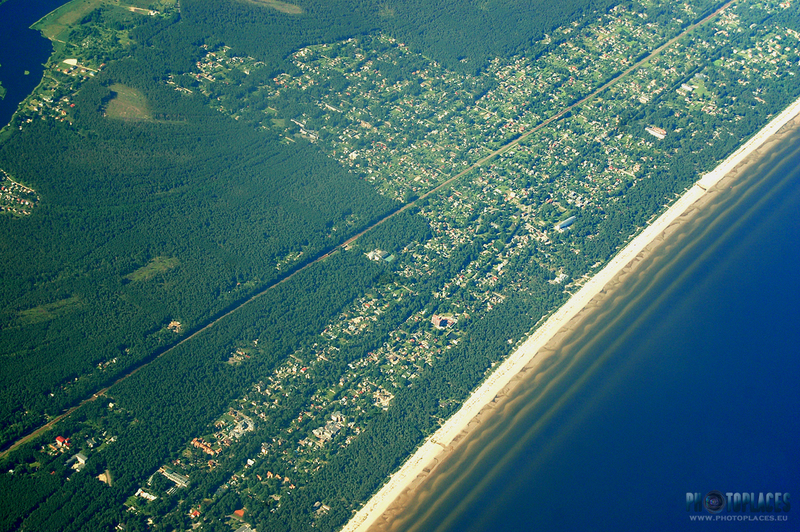 Seaside town right next to Riga is the most popular resort in Latvia with 30 km long, wide sandy beach. But there is much to admire also for an architecture lover - many historical wooden villas as well as interesting modern buildings are hiding below the seaside pine forest. TALSI. The main attraction of Talsi are it's hills - this town is blessed with several elevated natural view points from where it's panoramas can be observed. These topographic qualities are accompanied by some historical buildings and a few lakes and - bingo! - Talsi is another one of the most beautiful small towns in Latvia. BAUSKA. Setting at the confluence of three rivers makes Bauska incredibly beautiful from aerial perspective. Well, that's not the way how a usual tourist would visit the town, of course, but one of the best medieval castles in Latvia, wonderful nature park around it with several nice observation points, and also an old town located at the scenic river bank will be more than enough for him to feel visually satiated. VENTSPILS. Ventspils reputation and attractiveness is based mainly on it's developed infrastructure but the town has also pretty interesting historical centre with medieval castle, wooden and masonry buildings. Many urban environment objects such as fountains, sculptures, greeneries makes the cityscape enjoyable but the industrial harbor right in the opposite side of the river Venta adds a touch of rougher charm to it. DAUGAVPILS. The second largest town in Latvia boasts with a nice pedestrian street, impressive churches of various confessions, interesting relics of industrial era and the Tzarist time fortress which houses Marcus Rothko's museum nowadays. From modern developments, the highlight is Sports arena - probably the best architectonic achievement in Latvia of this type of buildings. JELGAVA. Razed to the ground in World War II, Jelgava has preserved little of it's past glory - however the largest palace in Latvia, beautiful, royal style museum building Academia Petrina, several nice churches as well as some modern projects (such as Pasta island redevelopment) keeps it in the Latvian town tourism radar zone. JEKABPILS. Historically a two towns, Jekabpils boasts with two historical centres, each on it's own bank of Daugava river. Both of them charms with their historical heritage and are worth long and attentive walks - even grit and neglectance seems to fit in there like a tasty spices to a Mexican or Indian food. TUKUMS. Most of Tukums worth-to-see places are concentrated on two streets - Lielā street and Pils street - and a Brīvības square between them. They offer some charming older houses and the whole historical part of the town is located on a hill. There's also a few smaller, silent streets nearby where one can enjoy the beauty of wooden architecture. SABILE. Sabile is a very small town (population just 1600) but a very charming one. It is situated at the slope of Abava river valley and from several places a nice view over town's lower part rooftops and to the opposite bank appears. Sabile is famous for it's vineyard - it's been registered in the Guinness Record Book as the most northern vineyard in the world (not true anymore), and there are other interesting places to see - such as open air art museum of Pedvale. KRASLAVA. The Eastern pearl of Latvia, Kraslava is located at one of the mighty Daugava river bends. The town is situated on the hillside of the river bank like on a terrace, opening nice views. Kraslava has also nice historical centre with interesting pedestrian street, charming wooden houses and even a palace with a park. Few other Latvian towns worth to consider visit are Kandava, Ludza, Limbazi, Saldus, Pavilosta and Plavinas. *Doxiadis classification defines that towns are populated places with 1 000 to 100 000 inhabitants. According to this, the number of towns in Latvia would be almost two times higher as in 2015 there were 68 villages in Latvia with a population larger than 1000 (as well as 3 towns which had a population below 1000). Some of these "villages" are larger than the majority of Latvian towns, for example, Mārupe (11 000) which as a town would be between 20 largest towns in Latvia, Ādaži (6000), Iecava (almost 6000), Ķekava (almost 6000) and others.